For the Performance Racing Network, it’s all about keeping the pace. Cover photo by Vishal Malhotra. Now that Doug Rice had made the call, it should have been time for racers to start their engines. But instead of beginning Sunday’s AAA Texas 500, a crucial race in the NASCAR season, 40 cars sat on pit road under car covers. A brief rain shower had made the track too wet to race, and the Texas humidity made drying it, even with jet dryers, a challenge. Texas Motor Speedway hosts two races each year, in April and November, in the highest tier of stock car racing, NASCAR’s Sprint Cup Series. Drivers once competed in automobiles you could buy at a dealership, though today’s high-performance racing vehicles only loosely resemble the Fords, Chevys, or Toyotas a fan might drive to the track. From humble roots in the South, NASCAR has become America’s most popular motor sport, with a season running from February’s iconic Daytona 500 to the season championship in Homestead, Fla., the weekend after next. In that final race, the National Association for Stock Car Auto Racing will declare the fastest of four pre-determined drivers the overall winner for 2016. In a playoff system called the “Chase for the Sprint Cup,” it has culled its highest-ranked drivers down to a final eight, and any of those who win one of the three races immediately preceding the Homestead event, including the one at TMS, would automatically qualify as one of those last four drivers with a chance to win the whole thing. And even for drivers not in the Chase, winning a race is huge. Thus drivers and their support personnel waited anxiously for the track to dry, as did thousands of fans at TMS. In addition, a crew of 18 headset-wearing NASCAR enthusiasts was preparing to embark on its own marathon of sorts. They were the men and women of the Performance Racing Network, a company for which Rice has worked since 1988. PRN’s president and lead announcer also told me during the stoppage that he has learned to not let the weather bother him, because it’s all part of the gig. PRN understands racing’s nuances. The company has been in business since 1981. It’s a property of Speedway Motorsports, Inc., the same group that owns Texas Motor Speedway. The only other major radio network that covers all NASCAR Sprint Cup racing is Motor Racing Network. The Daytona Beach-based International Speedway Corporation owns MRN, as well as racetracks where NASCAR holds 19 of its 36 Sprint Cup races. They cover all the races held at those tracks, plus those at Dover and Pocono. 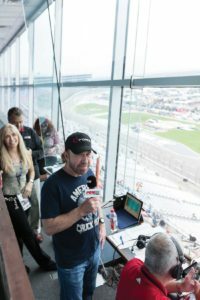 PRN handles lap-by-lap coverage for the dozen races staged at SMI’s tracks and partners with the IndyCar Radio Network for the Brickyard 400. The Indianapolis Motor Speedway, site of the Verizon IndyCar Series racing circuit’s Indianapolis 500, hosts the Brickyard 400. Individual tracks can choose their radio broadcasters, though NASCAR controls all television rights. Fans can listen to their productions on a number of outlets, including local affiliate radio stations, satellite radio, online, and at the track over a dedicated frequency on the scanners that fans can rent or buy at the race. Every time I’ve listened to a stock car race on the radio, I’ve come away amazed. One announcer talks, then another, and then a third and a fourth. Each picks up where the other left off, somehow keeping up with cars traveling close to 200 miles per hour without interrupting a colleague. Then a wreck happens, and suddenly they’re narrating that chaos, and minutes later they’re talking to the driver whose race has ended. It all sounds so smooth to your ears and mine, but I know, behind the scenes, it can’t be. Having worked in a lot of TV trucks covering sporting events with multiple cameras, I’ve seen how hectic it can get keeping up with a pair of teams playing with two or three announcers describing the action. So I always wanted to know how a crew could possibly manage a broadcast involving 40 teams on a mile-and-a-half playing surface with a half dozen or more commentators –– and all without the benefit of pictures. In some ways, they have a dream gig, one that millions of fans who religiously follow drivers like Burton no doubt envy. That doesn’t mean it’s an easy job. 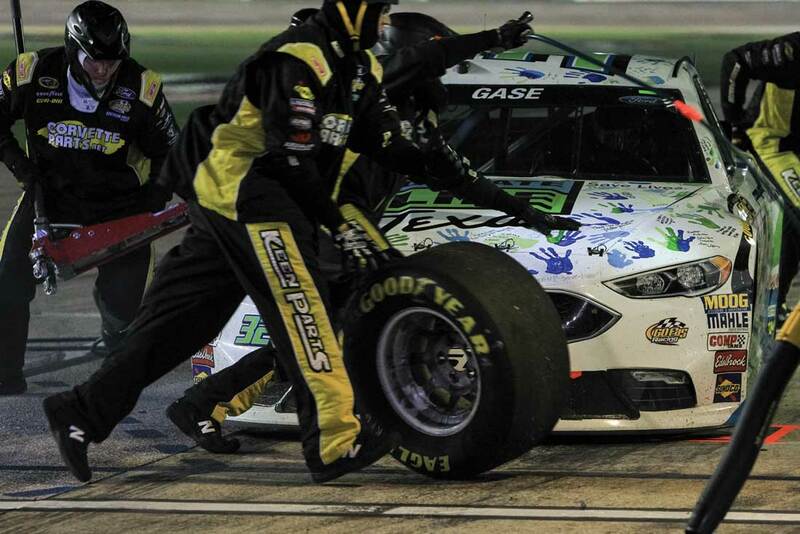 NASCAR’s complicated nature makes up part of the circuit’s appeal. After the green flag waves to begin the race, fans listening on their preferred device hear a succession of voices describing the action. Listeners might wonder how each broadcaster knows when to talk. It turns out they rely on some standard progressions as they follow the field of cars. Rice calls the action on the track’s frontstretch before turn announcer Rob Albright takes over. Mark Garrow is dialed in to alternate laps with Doug Rice. Photo by Vishal Malhotra. An automobile race never consists of one smooth sequence. Sometimes the focus must change from the cars circling the track to other areas of interest. Rice takes cues from a colleague in the booth. In painting the picture of whether or not those strategies succeed, the broadcasters don’t have actual pictures to help them. In a television truck, a director bears the responsibility for choosing what goes on the air next. While scanning multiple camera monitors does require a great deal of skill, the TV director can use his eyes as well as his ears to select his next source. A radio director or on-air presenter can only listen. Every person on the crew must master the art of mentally processing multiple audio streams simultaneously. Gillie also has to listen to his director and to what’s actually going out over the air, in case one of his on-air colleagues suddenly pitches to him. Rice has to talk while monitoring three audio feeds, including the official race communication channel. 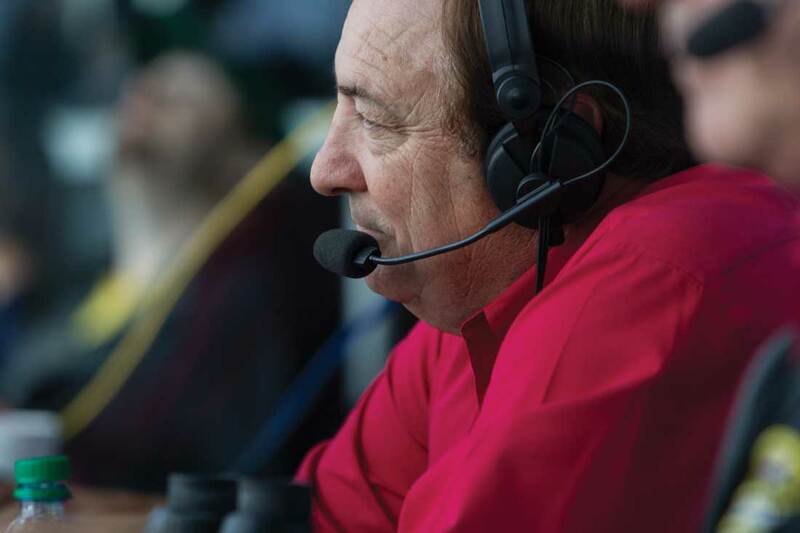 Leavitt, who normally works for the IndyCar Radio Network but filled in with PRN at the races in Charlotte and Fort Worth, listens to all those sources plus the engineers. Making sure all those sounds get to all those ears means an extensive technical operation under supervision of PRN lead engineer Harrill Hamrick, who mixes the show from a truck near the garages. In Fort Worth on Sunday, no technology could remedy one of a sports broadcaster’s most untenable situations. “Weather always adds a huge unknown X factor to this,” Rice said. During Sunday’s delay, Rice and his colleagues stayed on the air long enough to explain the situation to the audience and to speak to a special booth guest: Chuck Norris. The former Walker, Texas Ranger star had come to the track to announce the names of the eight Chase drivers. He helped PRN fill time by talking about Chuck Norris facts. He likes them and finds them funny. Chuck Norris fact: He eats bullets. Watch out when he burps. Photo by Vishal Malhotra. The speedway displayed a variation on the meme on their Big Hoss video board, a mockup of Norris kicking Michael McDowell’s car into a wreck. When a real mishap occurs on the track, the normally jocular announcers treat it as nothing to laugh about. PRN’s veteran broadcasters know auto racing’s protocols. Still, a reporter like Gillie must often approach a driver during testy times, such as after a mechanical issue has forced his or her ride off the track. As official race broadcasters, PRN personnel have clearance to speak to drivers even as the race continues around them. Tone and approach become crucial to turning access into information. Drivers understand broadcasters must cover the tough parts as well as the victories. Burton believes the unique nature of motorsports helps foster collegiality between the contestants and those who cover them regularly. “I think what makes our sport really, really special is that contact,” Burton said. 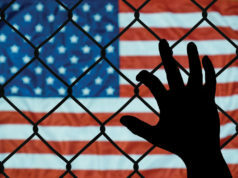 “Think about the NFL. They’re with different broadcast people every week. The local [team] has their own radio station, but the network changes, as opposed to NASCAR. You’re with the same people pretty much every week. You’re either with PRN or MRN, or you’re with Fox or NBC [on the TV side]. And so you get to know everybody. By engaging with reporters, a driver does more than reach out to his followers. He or she also advances the business side of the sport. A driver who talks to the media will likely do so wearing clothing bearing corporate logos. He or she will almost invariably find a way to verbally namedrop one or more companies who pay for association with the race team. Sponsors pay for the costs of running a race team. And like most media ventures, advertisers finance the Performance Racing Network. He sees the audience that his salespeople take to market as pretty well defined. 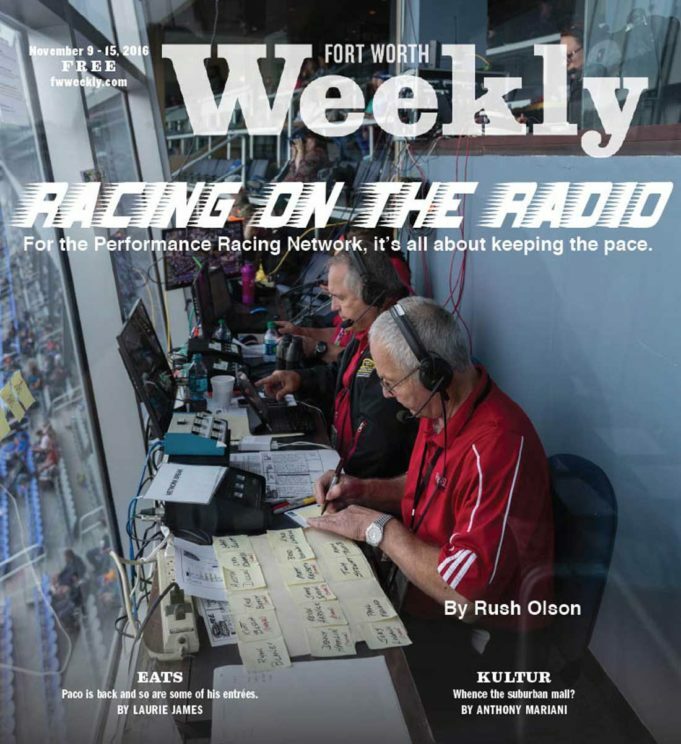 In Fort Worth, the congregation can find PRN’s work on 95.9-FM The Ranch, whose bosses signed on this year to carry PRN’s Texas race broadcasts and tap into its listener base. The Ranch also believes racing will appeal to its existing listeners. With NASCAR, the reporters are in the huddle. Photo by Vishal Malhotra. 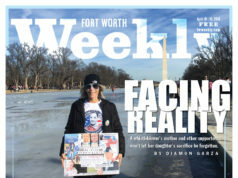 TMS has “put together a great relationship with the Ranch, not just for the broadcast that PRN does but for a lot of the other stuff that Texas [Motor Speedway] does as the official radio station,” said Gillie, who graduated from Euless Trinity High School, lives in Fort Worth, and formerly worked for the speedway. One might interpret NASCAR followers’ transfer of loyalty from sport to sponsor as naïve, an example of less-than-sophisticated thinkers being influenced by advertising. More likely, it represents a true understanding by those fans of how such relationships work. Brands want to cultivate those fans’ loyalty through their sponsorships. By providing them what they want, fans do their part to ensure the viability of their favorite drivers and their favorite sport. Such is the NASCAR culture. As sports fans, and racing fans in particular, it perhaps reflects a desire to feel a bond with something beyond the grind of everyday jobs and challenges. We all wear the shirts, caps, and underwear of our favorite sports teams. 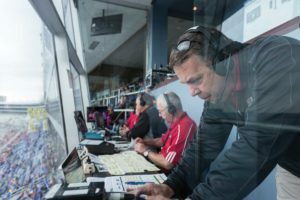 Sports radio broadcasts, perhaps more than any other mass medium, serve much the same function by allowing us to bring our passions into our spaces, at our desks, on our commutes. With the NASCAR season’s final pair of races at non-SMI tracks, PRN’s AAA Texas 500 broadcast represented its final one of 2016. However, they won’t sit idle until February’s Daytona races restart NASCAR’s calendar. As much planning as PRN staffers will do in their short offseason, when the time comes to race again, they will once more find themselves dealing with situations at the track that nobody expected. In fact, when it comes to a NASCAR broadcast, the unpredictable parts take top priority. To establish proper priorities, and create the workflows to accomplish them, one has to understand the essence of one’s business. It’s a lesson Rice learned at the first running of the Brickyard 400 in 1994 from a pair of seasoned colleagues at the IndyCar Radio Network. At Sunday’s event, they never got to transport the listener to the finish line for the waving of the checkered flag. Though the race did eventually start after a six-hour delay, a second downpour ended the contest several laps short of the planned 500-mile run. NASCAR officials informed Carl Edwards he had won as the cars sat idling on pit road. We’ll never know which announcer would have called the winner across the finish line. It’s all part of the unpredictability of sport. This sport, and bringing it to those who love it, is what PRN is all about. They have, in fact, found the right business. “They make magic,” Schlegel said. “These guys are incredible. The description, it’s very high-energy, super-fast pace. They cut from one person to the next. They’re describing exactly what they see in front of them, sparks flying off the fenders. You can hear the engines and the energy is unlike any other kind of broadcast. 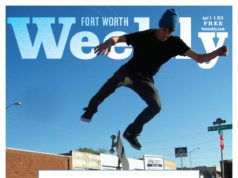 Rush Olson writes the Fort Worth Weekly’s sports blog and produces sports content and related endeavors through his companies Rush Olson Creative & Sports and FourNine Productions. Read more of his interview with Jeff Burton in this week’s Sports Rush blog post, found in the Blotch section at fwweekly.com.